That's it boys and girls.Today is the day when Rockman Exe ( AKA Megaman Battle network 1) got released in Japan in 2001.At first people were sceptical about this new game style of Megaman but then people,especially the kids got hyped really quick about it(I can remember when i first played the original JAPANESE version of BN1,i had hard time understanding what's going on but it still kept me playing for no reason). I think the most hyped game was Battle Network 5 by all the kids since,you could play as Protoman!! 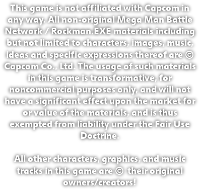 and Colonel as well,depending on your version.As time passed the series got some 'side attachments' such as Battle Chip Challange, Rockman exe wonderswan and the all cool Network Transmission for the gamecube which pushed the universe of battle network into the game mechanism of the old megaman games. I remember when i was 15 and finished playing BN6 i was really sad as i read the text at the end of the game "Battle Network END" knowing that this was the last battle network game that i could play,but i thankfully i can still replay these dear games anytime for the joy of the sweet memories of my childhood.I'm listening to the musics of all battle network games while writing this article,and i must say it's quite nostalgic and gives me the chills thinking about how much fun i had with these masterpieces,especially with my favourite installment, Battle Network 3. I hope all of you guys do at least what i do today,listening to some BN tunes,watching some vids,and playing a bit with them, to celebrate Keiji Inafune's great work.If you're looking for videos to watch about the games and their memories,i recommend FusionZX's channel on youtube.Here is on of his videos. Enjoy the celebration. I'm really graceful that i could play your games Keiji! The whole Chrono X team is really thankful for your had work! THANK YOU AND HAPPY CELEBRATION EVERYONE! Time for some update!. In past few weeks while our spriters were working on new stuff, I spent my time on optimizing the game's code, so now it gonna be working faster/better on older computers(they still need to meet the minimal requirements! ), as well as using less of RAM. And now, we are getting very close to relase. 4th demo gonna enter RelaseCandidate stage soon, what left is adding few more chips, viris, plot-wise stuff, NPCs(that's why the screenies looks soo empty without other characters, but it's much easier and faster to add them as the last thing) and of course hard beta testing. It sounds like not much of work, but in fact it's a lot, so stay tunned for more updates! Spriter's APP submission is still open, so who haven't send the email yet, should do it soon. Now, as always, time for screenshots from upcomming 4th demo! Yep, so in short, if you guys decide to sign up on our forum, you will have to wait a max of ONE day (that's 24 hours or less) for us to manually approve your account. We are doing this because we refuse to pay for hosting. Which is why that when you sign up, your account will be approved by an admin such as myself. They didn't even send us an email, notifying us of this move, so everyone who had signed up but couldn't get activation email, sorry. We shall keep this host, because we don't want to change our URL everywhere that we posted it. Sorry for the inconvenience.